Livery vehicles are vehicle/driver combinations for hire, as are taxis (see Hire), with the difference between the two types being that livery cars cannot solicit passengers on the street. Instead, livery services must be prearranged for. The earliest know L-prefix plate is from 1923. With the probable exception of the mid-1930s through late 1940s, plates of this type have always been designated by an L prefix. When plates were issued annually and for years for which examples of plates of this type are known (i.e. the 1960s), numbers presumably began at LA-100 or LA-101 and progressed as high as necessary. That no used plates of this period have been observed with numbers higher than LA-358 indicate that it is unlikely that more than 300 sets of Livery plates were ever issued during a single year, making this a scarce type. License plate collectors of the 1960s (one in particular) apparently collected used plates from the relatively few companies to which they were issued, making them somewhat common today, but this belies their status relative to the prevalence of plates of other types on D.C. roads while they were in use. Livery plates are still relatively rare today. 1974 Baseplate The BICENTENNIAL baseplate was likely issued for livery vehicles during the same period that it was issued for passenger vehicles, that being April 1974 through March 1978. We also assume that L-101 was the first number issued because 101 is the known starting point for other types on this base. The only observed number is L-119. 1978 Baseplate This base was probably issued only for new registrations from April 1978 through Sept. 1984, as was the case with auto plates of the same design. The only observed number is L-1007. 1984 Baseplate This base was likely introduced in Oct. 1984, when the design was introduced for passenger car plates, or possibly shortly thereafter. All 1974 and 1978 baseplates then in use were likely replaced by plates of this design. The lowest and highest numbers observed on the 1984 base are L-1648 and L-3440. 1993 Baseplate - Celebrate & Discover slogan at top Although this base was introduced for auto plates in mid-1991, it was probably a few more years before all 1984 baseplates could be issued, at which time the change would have been reflected on livery plates. 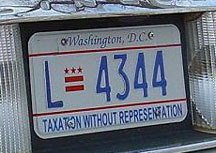 The lowest and highest numbers observed on plates with the slogan at the top are L-3532 and L-3784. 1997 Baseplate - Celebrate & Discover slogan at bottom When the general-issue passenger registration number format was changed to AB-1234 in April 1997, the position of the city name and slogan were reversed. The lowest and highest observed numbers of this base are L-3899 and L-4128. 2001 Baseplate The first livery plates with the "TAXATION" legend have an embossed registration number, so we assume they were issued during 2001, shortly after the passenger version of this base was introduced in Nov. 2000. The lowest and highest observed numbers in this relatively small batch of plates are L-4269 and L-4392. 2002 Baseplate We believe that flat livery plates began to be issued in 2002 or 2003. 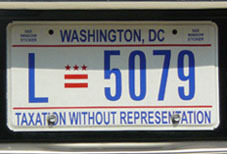 The lowest observed plate of this style is L-4562, and as of late August 2008 the highest number seen in use was L-5957. This 1964 Livery registration certificate, for plate no. LA-227, was carried in a 1962 Checker Marathon station wagon as it transported passengers to and from National Airport and other D.C., Md., and Virginia destinations. The circular stamps on the back provide evidence of the vehicle having been inspected on July 8, 1964, and January 26, 1965. Note that this heavy paper certificate has been marked with unusual paper punches that left the impressions of numbers 53, 56, and 57.